Fascinating news out of Hamilton yesterday. 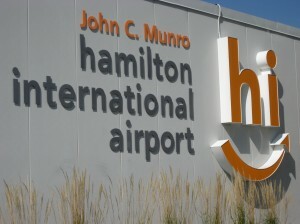 John C. Munro Hamilton International Airport (CYHM) announced funding for construction of a new $12-million, 60,000-square foot, cargo terminal. The federal and provincial governments are going to chip in $8 million and Tradeport International, which manages the airport via contract for the city, will add $4 million. It’s an interesting step from an infrastructure point of view and might help generate enough critical mass for the airport to grow and perhaps one day meet its potential. See, YHM is a strange, woefully underused, beast. It’s an enormous facility. It has a long, 10,000-foot runway (12/30) capable of handling virtually anything in the air and a decent 6,000-foot secondary east-west runway, which was slated for expansion to 9,000 feet some time between 2015 to 2019 (am uncertain if that’s still in the works). While serving as the site of the modern-looking Canadian Warplane Heritage Museum (see yesterday’s post), some of the hangers have a forlorn, although endearing, vibe about them, harkening back to the days when it was part of the British Commonwealth Air Training Plan during the Second World War. In fact, it was constructed in 1940 to be part of the BCATP. The airport captures a lot of traffic from nearby Lester B. Pearson (CYYZ) because, unlike Pearson, YHM doesn’t have a curfew. While this is a source of frustration for nearby residents, it’s allowed the airport to set itself up as a niche cargo facility. Cargojet, Purolator, UPS, DHL and SkyLink and Kelowna Flightcraft all run cargo out of the facility in part because they can’t get into Pearson between 12:30 a.m. and 6:30 a.m. without paying exorbitant fees. Given the amount of cargo moved in and out — 430,000 kilos in 2011 and cargo growth in each of the past five years — it makes sense to play to the airport’s strength. No doubt the new facility, which will enable the airport to handle refrigerated goods and efficiently move trucks in and out of courier facilities, will generate more cargo air traffic. Construction is expected to begin later this year finish by mid-2014. Certainly YHM could use the shot in the arm. 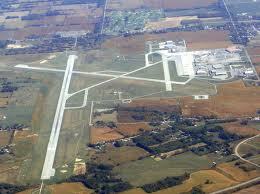 Given its size, and considering the population nearby, the airport is desperately underutilized. According to StatsCan, Hamilton ranked 39th in Canada last year in aircraft movements. While cargo operators like it, passenger operators have come and, mostly, gone, despite being designated an Airport of Entry, with customs and immigration officials on site. Consider that YHM handled 332,000 passengers in 2011. Pearson handled 33.4 million. Part of the blame, I’d suggest, rests with the airport itself, which has long favoured cargo over passenger service. It’s telling, for instance, that Tradeport was willing to pony up for yesterday’s cargo facility expansion but hasn’t yet built covered ramps, or jetways, for the passenger terminal. Passengers are still forced to use stairs to board and deplane, which isn’t adequate in a country with our climate and hardly provides incentive for a passenger operator to set up shop. Still, even without the jetways, the airport is extremely user-friendly, and I know this first hand, having worked their for six months as a WestJet customer-service agent. Passengers love flying out of Hamilton. Parking is abundant and cheap. Traffic is rarely an issue. Check-in is quick, simple and efficient. Passenger service briefly enjoyed a renaissance in 2000 when WestJet made it their eastern Canadian hub. In 2004, however, the airline moved the majority of its operation to Pearson, leaving just a few flights out of Hamilton. The airline still owns a hangar and offices at the airport and has been trying to sell them, so far unsuccessfully. Flyglobespan flew overseas out of Hamilton for a few years, but stopped in 2009 after it went bankrupt. Playing in the background of yesterday’s announcement is a desire by the City of Hamilton to turn the airport’s vast surrounding farmland into something of a business park, leveraging the economic activity generated by the airport itself. The city plan, entitled Airport Employment Growth District (AEGD) is facing stiff public opposition, is being appealed and is now before the Ontario Municipal Board. No doubt the city’s hope is that expanded cargo traffic will help justify the business park, which has been dubbed aerotropolis. I confess I have a soft spot for the airport (I will forever remember shooting the ILS 12 approach there when I did my IFR ride) and the Hamilton area (I was born in Hamilton and much of my family still lives there) and would like to see it thrive. Given the need for a second major airport to serve the Greater Toronto area, and given the immense resistance to construction of such a facility in Pickering, I can’t help but wonder why Hamilton isn’t touted as the obvious solution: Its excellent, underused, infrastructure already exists. Perhaps the cargo facility will be a step toward that eventuality one day arriving. This entry was posted in Airports, Industry News & Commentary and tagged airports, cargo, CargoJet, DHL, Hamilton, John C. Munro, Kelowna Flightcraft, Pearson, Purolator, Tradeport, YHM, YYZ on January 11, 2013 by Craig Daniels.